Longitudinal data from 229 PAD patients were obtained in an observational study in southern Netherlands. Utility scores were calculated with the international (SF-6D) and Dutch (EQ-5D) tariffs. We analysed treatment effect at years 1 and 2 through propensity score-matched ANCOVAs. Thereby, we estimated the marginal means (EMMs) of revascularisation and conservative treatment, and identified covariates of revascularisation effect. A year after diagnosis, 70 patients had been revascularised; the EMMs of revascularisation were 0.038, 0.077 and 0.019 for SF-6D, EQ-5D and VAS, respectively (always in this order). For conservative treatment these were − 0.017, 0.038 and 0.021. At 2-year follow-up, the EMMs of revascularisation were 0.015, 0.077 and 0.027, for conservative treatment these were − 0.020, 0.013 and − 0.004. 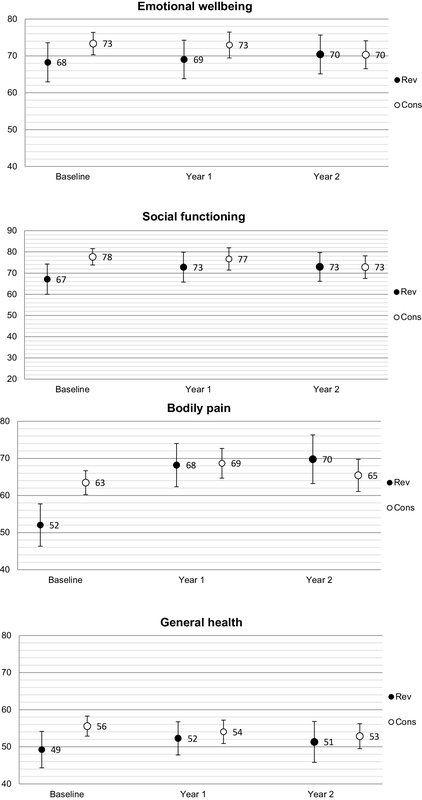 Baseline QoL (and rest pain in year 2) were covariates of treatment effect. We measured positive effects of revascularisation and conservative treatment on QoL a year after diagnosis, the effect of revascularisation was sustained over 2 years. The magnitude of effect varied between the metrics and was largest for the EQ-5D, which may be most suitable for QoL measurement in PAD patients. Baseline QoL influenced revascularisation effect, in clinical practice this may inform expected QoL gain in individual patients. Peripheral arterial disease (PAD) is a chronic disease, characterised by the atherosclerotic narrowing of the lower extremity arteries . PAD prevalence is estimated to be 3–10% overall, and 15–20% in the population older than 70 ; these numbers seem to be increasing . The disease spectrum ranges from asymptomatic PAD to limb and life-threatening acute leg ischemia . Symptomatic PAD, characterised by exercise-induced occurrence of ischemic muscle pain, causes loss in quality of life (QoL) through reduced physical well-being, mobility, independence and capacity to handle everyday life . Peripheral revascularisation, the open- or endovascular restoring of blood flow in the legs, (f.i. angioplasty, bypass surgery), is typically applied for acute limb ischemia or disease progression despite conservative treatment  to restore peripheral reperfusion and reduce the symptom burden. Previous studies have shown a positive effect on QoL a year after revascularisation ; the long-term effects of revascularisation are less verified as progression of atherosclerosis can cause restenosis . Studies showed that 6 months after revascularisation, mean EuroQoL five Dimensions (EQ-5D) utilities increased, then stagnated during the following year ; 4 years after revascularisation, pain was the only Nottingham health profile domain significantly improved . This calls into question the sustainability of the effect of revascularisation on QoL. Guidelines recommend revascularisation only in selected patients with mild to moderate disease . This indicates that disease severity might be a covariate of revascularisation effect on QoL, and some patients might achieve more desirable results than others. This hypothesis is supported by studies showing that 1 year after revascularisation, a proportion of patients did not achieve the desired results: 24.4%, 30.8% and 21.0% of patients did not have improved SF-36 domain scores for physical function, pain or a relevant EQ-5D utility improvement, respectively [10, 11]. In the above-mentioned studies, different methods were used to generate preferences for QoL. The Short Form 36 Health Survey (SF-36) and EQ-5D are based on the valuation of hypothetical health states by members of the general public, i.e. general public preference, in contrast the Nottingham health profile uses the patient’s self-perceived health state preference, i.e. patient preference. It is acknowledged that different methods to generate QoL estimates will measure different aspects of QoL and thus will result in similar but not identical estimates. Research on instruments using general public vs. patient preferences has shown that results can differ, with the general public valuing health worse than patients do . These findings have been confirmed in the valuation of cardiovascular events . All mentioned instruments are generic, i.e. not designed specifically for PAD patients but can be used in any patient population. Differences can also arise between two generic, general public-based instruments , and arguments for and against several generic instruments in PAD patients have been presented [15, 16, 17, 18]. The review of Poku et al. concludes that the evidence on the psychometric properties of QoL instruments in PAD patients was limited and did not allow for the detection of superiority of one instrument. The evidence focussed on construct validity and responsiveness and reported favourable results for both SF-6D and EQ-5D. The review of Dyer et al. positively commented on the convergent validity and responsiveness of the EQ-5D in PAD patients but did not assess the SF-6D. PAD treatment is not curative but targeted at relieving PAD symptoms. 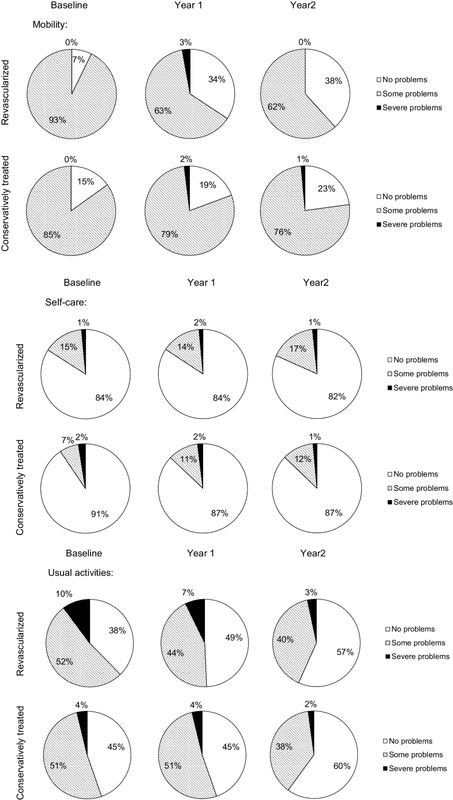 Consequently, sustainability of QoL gains after revascularisation and variability in the magnitude of gains by patient characteristics are relevant factors in clinical decision making. Beyond that, however, estimations of treatment effect on QoL directly affect the number of quality-adjusted life years attributable to that intervention, and thus play a key role in the evaluation of cost-effectiveness of PAD treatment. Differences between QoL instruments can influence cost-effectiveness estimates, which can misinform policy decision and eventually can lead to the suboptimal use of healthcare. To address those issues, we (1) evaluated, 1 year after PAD diagnosis, the effect of revascularisation on QoL in terms of magnitude and influence of covariates, and compared these results between three QoL metrics, (2) evaluated, 2 years after PAD diagnosis, the sustainability of the effect of revascularisation in year one on QoL, in terms of magnitude and influence of covariates and compared these results between three QoL metrics. This paper presents estimates of treatment effect and offers recommendations for the choice of QoL metric. This observational study was conducted between January 2009 and November 2013 in three Dutch hospitals. Approval was obtained at the Medical Ethical Committee (CMO) of the MUMC+. Medical history and QoL was documented in consecutive newly diagnosed PAD patients, who were followed up over 2 years with repeated QoL measurements and documentation of peripheral revascularisation interventions. Patients referred to the vascular department for newly diagnosed PAD were eligible for participation. Inclusion criterion was an ankle brachial index (ABI; the ratio between systolic blood pressure in ankle and arm, measured at rest ) of < 0.9 in any leg, measured in the hospital. Patients were included after signing informed consent. Exclusion criteria are listed in Appendix 2. Furthermore, patients were excluded from the analysis when none of the baseline and follow-up QoL instruments had been returned. To ensure homogeneity of time since revascularisation, patients were excluded when revascularisation took place less than 90 days before year 1 follow-up, this was based on medical expert opinion. For each patient, a case report form was created in an online database, containing patient characteristics, QoL and treatment. Patient characteristics were self-reported in an interview with a research nurse or study physician. At baseline, 1 and 2 years after study inclusion, patients filled in the SF-36 and the EQ-5D measurement instruments. By questionnaire, patients reported treatments received and cardiovascular events experienced during the previous year, 1 and 2 years after baseline (see Appendix 2 for a definition of cardiovascular events); these data were cross-checked with patient medical files for completeness. A research nurse telephoned the patient upon missing data or ambiguous answers. A summary of patient characteristics tested as covariates of treatment effect, their definitions and specifications used in the analyses is given in Table 1. Patients received conservative treatment according to PAD guidelines . This included lifestyle advice regarding smoking cessation and physical exercise, and pharmacotherapy focussed on controlling blood pressure and cholesterol levels. Patients were advised to do unsupervised exercise or received exercise therapy supervised by a physiotherapist. Invasive treatment was defined as peripheral revascularisation which entailed endovascular interventions (e.g. angioplasty with and without stent placement) and open surgery (e.g. atherectomy and endarterectomy, and bypass surgery). Revascularisations were considered relevant for this study when performed within 1 year of PAD diagnosis. The SF-36 is a well-known generic health-related quality-of-life (HR-QoL) metric that has been extensively tested in Dutch populations . The SF-6D has been developed to estimate HR-QoL using ten of the thirty-six items of the SF-36 . Four to six ordinal answers are offered per item, each answer matched with a preference weight to value the desirability of the answer. In the absence of a Dutch tariff, the UK tariff of the SF-6D was used. Combining the valued item responses, domain scores and an overall utility are calculated, each of them between 0.29 and 1.00 to indicate maximum disability to perfect health . The EQ-5D is a generic QoL instrument. Since 2008, the 3-level version of the EQ-5D used in this study is the preferred QoL measure in economic evaluations conducted for NICE in the United Kingdom . In the Netherlands, this recommendation has been superseded in favour of the newer 5-level version of the EQ-5D in 2016 .The instrument consists of two metrics, the first being a self-classification of health in five domains: mobility, self-care, usual activities, pain/discomfort and anxiety/depression. The respondent indicates if ‘no problems’, ‘some problems’ or ‘severe problems’ occur in each domain; the Dutch tariff of Lamers et al. is used to value the response with a preference weight. All domains combined, a utility is created; the maximum utility of one indicates perfect health, a utility of zero indicates death and the minimum utility of -0.33 indicates conditions worse than death . The second metric, the Visual Analogue Scale (VAS) is a psychometric response scale, recording the respondent’s valuation of their overall health on a scale from 100 to 0, representing best imaginable to poorest imaginable health . The VAS represents a patient’s preference for her own health state. For comparability purposes, VAS scores were divided by 100 to create a score between 1 and 0. 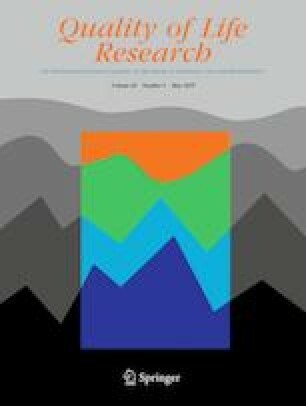 To prevent a loss of precision and the introduction of bias through the exclusion of patients with missing data, missing items of the quality-of-life instruments and baseline patient characteristics were replaced using multiple imputation . Categorical items of the QoL instruments were imputed using dummy coding . We set the number of imputations to 10 and performed sensitivity analysis comparing outcomes of the pooled imputed datasets to a complete case analysis (see Appendixes 1 and 4). Patients who died received a score of 0 in all following QoL measurements. For each of the 10 imputed datasets, a propensity score (PS) was estimated using logistic regression of baseline patient data . The propensity score was created by testing all baseline patient characteristic parameters for their ability to predict treatment assignment, selecting those parameters with the highest C-statistics and adding parameters that remained unbalanced until the propensity score resulted in adequate covariate balance of baseline characteristics. On this score, each revascularised patient was matched (with replacement) with one conservatively treated patent using the nearest neighbour technique and a calliper of 0.2 . 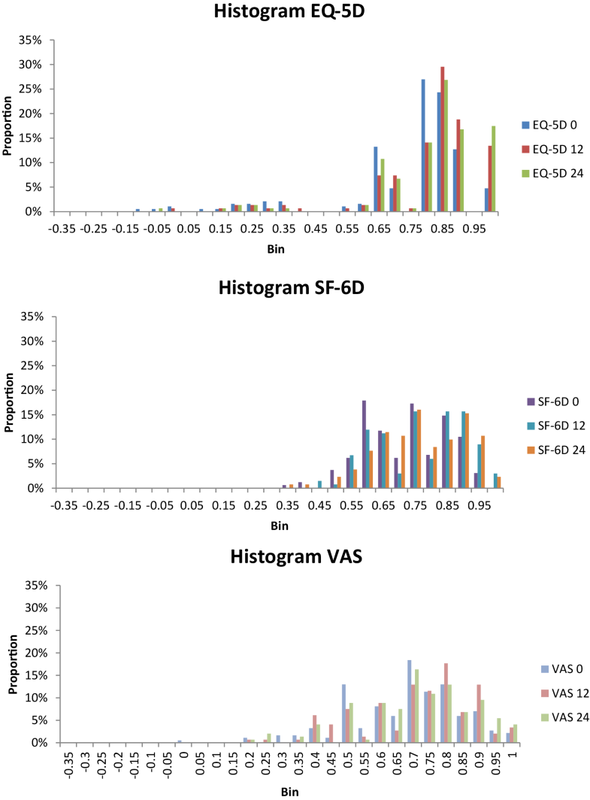 Covariate balance after matching was assessed by comparison of patient characteristics in the treatment groups and by means of visual inspection of QQ plots and PS distributions in the original and matched groups . PS-matched datasets are adjusted against confounding by indication of treatment, allowing outcomes of treatment groups to be compared. PS matching was performed in R version 3.3.3. Characteristics of patients with complete and incomplete QoL measurements were compared using Bonferroni corrected t tests and Chi-square tests . Paired-samples t test were used to compare baseline QoL scores of the three instruments. Scatterplots and Pearson correlations were used to explore the effect of time since revascularisation on QoL change at year 1 follow-up. a sample excluding patients revascularised in the second half of the first follow-up year. All statistical analyses were conducted on SF-6D, EQ-5D and VAS for comparison, using IBM SPSS Statistics version 23. The study population consisted of 285 patients. After exclusion of 56 patients for completely missing QoL measurements, the population analysed consisted of 229 PAD patients (see Fig. 1 for patient flow). Between 16.6 and 42.4% of metrics were missing, the measurement time with the largest proportions of missing values was 1-year follow-up and the metric with the largest proportions of missingness was SF-6D (see Table 5 in Appendix 1). Patients with and without missing QoL scores showed few differences in baseline characteristics (see Table 6 in Appendix 1). Mean age at baseline was 66 years (SD 8.141), the cohort consisted of 64.6% males and 53.3% current smokers. Mean resting ABI was 0.72 (SD 0.188), the prevalence rates of Fontaine stages IIb, III and IV were 33.6%, 2.2% and 0.9%, respectively (see Table 2 for more baseline patient characteristics). Mean baseline QoL was 0.689 (SE 0.009) measured by the SF-6D, 0.637 (SE 0.019) measured by the EQ-5D and 0.665 (SE 0.015) measured by the VAS. SF-6D and EQ-5D QoL were significantly different from one another, for further details on baseline QoL, see Tables 6 and 7, Figs. 2a and 5 in Appendix 1. At 1-year follow-up, 70 patients (30.6%) had received revascularisation, and no relationship was detected between time since revascularisation and change in QoL at year 1. Eighteen patients (7.9%) experienced a cardiovascular event in the first year and seventeen patients during the second year (7.4%). Seventeen patients were revascularised in the second year (7.4%). The descriptive system of the EQ-5D revealed that QoL gains after revascularisation were driven by increasing proportions of patients reporting ‘no problems’ with pain/discomfort, mobility and usual activities (see Fig. 3 in Appendix 1). All SF-6D domain scores increased, the largest increases were observed in the domains physical functioning, role limitations physical and pain (see Fig. 4 in Appendix 1). Propensity score matching resulted in improved covariate balance between revascularised and conservatively treated patients. The propensity score and overviews of covariate balance after matching are presented in Appendix 3. Therefore, matched data were used in the ANCOVA analyses. The ANCOVA model (Table 3) showed that baseline QoL is a covariate of QoL change after treatment. All other baseline patient characteristics (see Table 1 for characteristics) and treatment type were not significant covariates. The models indicated QoL gain after treatment was larger in patients with low baseline QoL. Post hoc analyses of the ANCOVA models (Table 4) produced PS-matched EMMs of revascularisation and conservative treatment at year 1. EMMs after revascularisation are consistently positive, while those of conservative treatment are positive and negative (see Fig. 2b in Appendix 1). EMMs of revascularisation and conservative treatment do not differ significantly. Between the metrics, EMMs and mean differences vary in magnitude, EQ-5D EMMs and SF-6D mean differences are largest, VAS EMMs are lowest and the mean difference is negative. Scenario analyses confirm these observations, only the complete case scenario produced scores somewhat different (see Appendix 4). 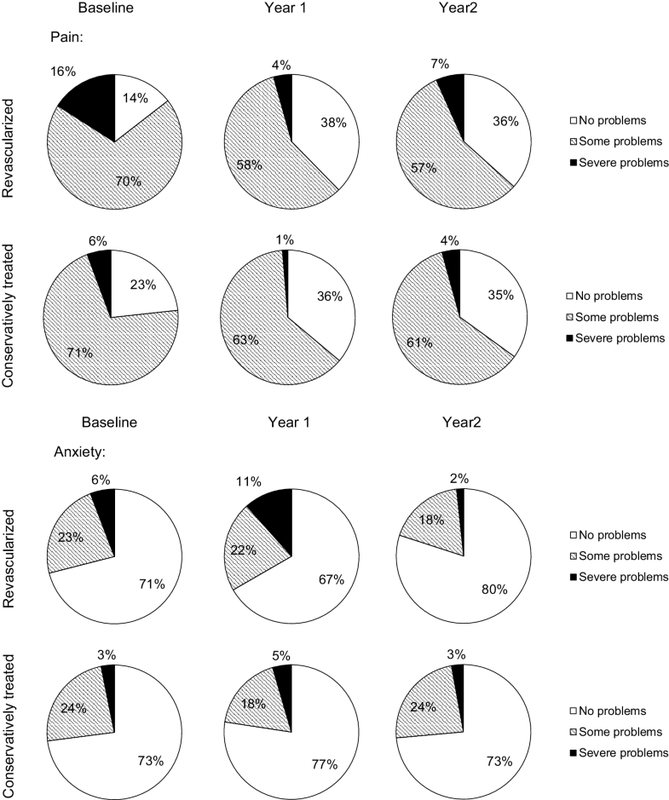 As seen at 1-year follow-up, patients revascularised in year one reported less problems with pain/discomfort, mobility and usual activities in the EQ-5D (see Fig. 3 in Appendix 1). All SF-6D domain scores were increased compared to baseline and year one follow-up except for physical function, which decreased compared to year one follow-up but remained increased compared to baseline (see Fig. 4 in Appendix 1). Baseline QoL and rest pain are significant covariates of QoL change after treatment, while all other baseline patient characteristics and treatment group were not significant covariates (Table 3). QoL gains after treatment are larger in patients with low baseline QoL, and lower in patients with rest pain. As at year 1, year 2 EMMs after revascularisation are consistently positive and those of conservative treatment are positive and negative (see Fig. 2c in Appendix 1). Unlike in year 1, all mean differences are positive, yet not statistically significant (Table 4). In comparison to year 1, EMMs of revascularisation were increased, stagnated and decreased measured by SF-6D, EQ-5D and VAS, respectively. Between the metrics, EMMs and mean differences vary in magnitude, the EQ-5D has the largest scores. Scenario analyses also confirm these observations and show similar scores, only the complete case scenario produced scores somewhat different (see Appendix 4). A year after diagnosis, the effect of revascularisation on QoL is insignificantly positive, and is influenced by baseline QoL. The effect of revascularisation is insignificantly larger than the effect of conservative treatment. Two years after diagnosis, the positive effect of revascularisation on QoL is sustained. Factors influencing the maintained effect of revascularisation on QoL are baseline QoL and rest pain, the latter only on EQ-5D scores. 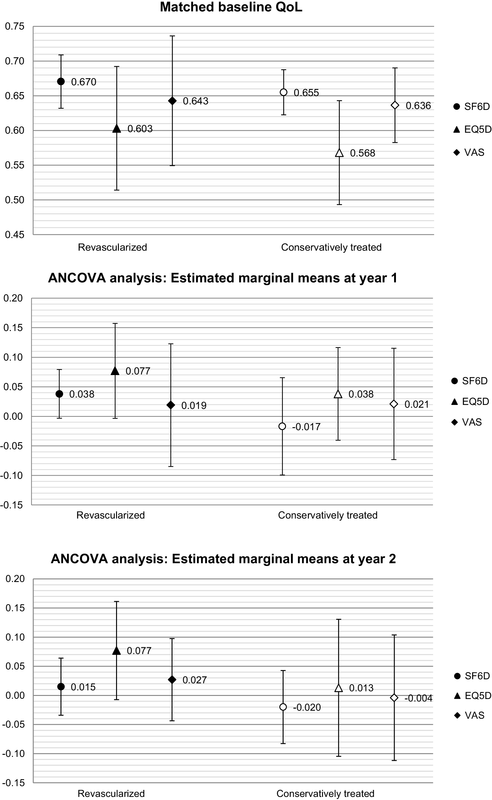 Compared to the first year, a decreased, stable and increased revascularisation effect is depicted by SF-6D, EQ-5D and VAS, respectively. Magnitude of revascularisation effect is generally largest when considering the EQ-5D. We found positive effects of revascularisation on QoL at years 1 and 2 measurements. This is in line with literature reporting QoL gains of 0.07 to 0.19 measured with the EQ-5D [10, 37, 38], significant increases in all SF-36 domains  and a VAS gain of 0.12 1 year after revascularisation . 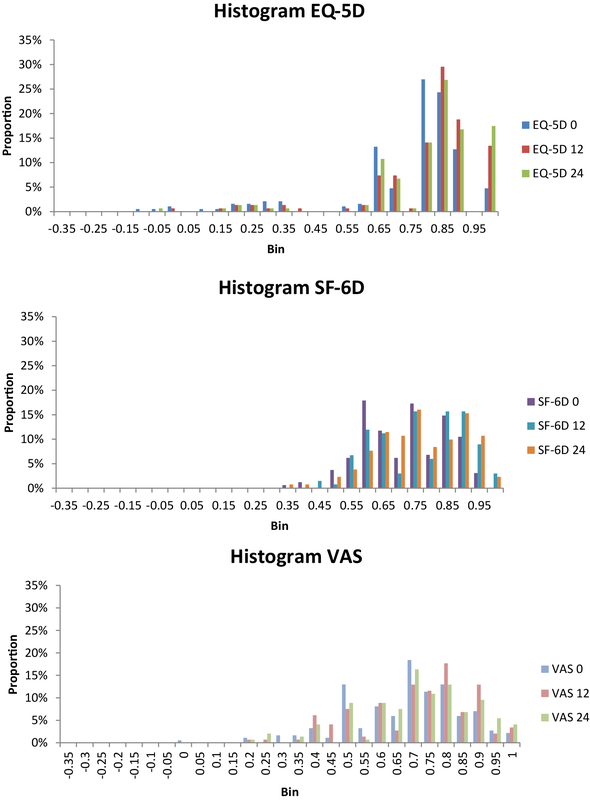 Moreover, EQ-5D, VAS and SF-36 domain scores 2 years after PAD diagnosis were in line with long-term follow-up scores measured 11 years after revascularisation in van Hattum et al. . Regression analysis had previously shown age, BMI, education, severity of disease and baseline general health to predict SF-36 domain scores 1 year after revascularisation [11, 40]. 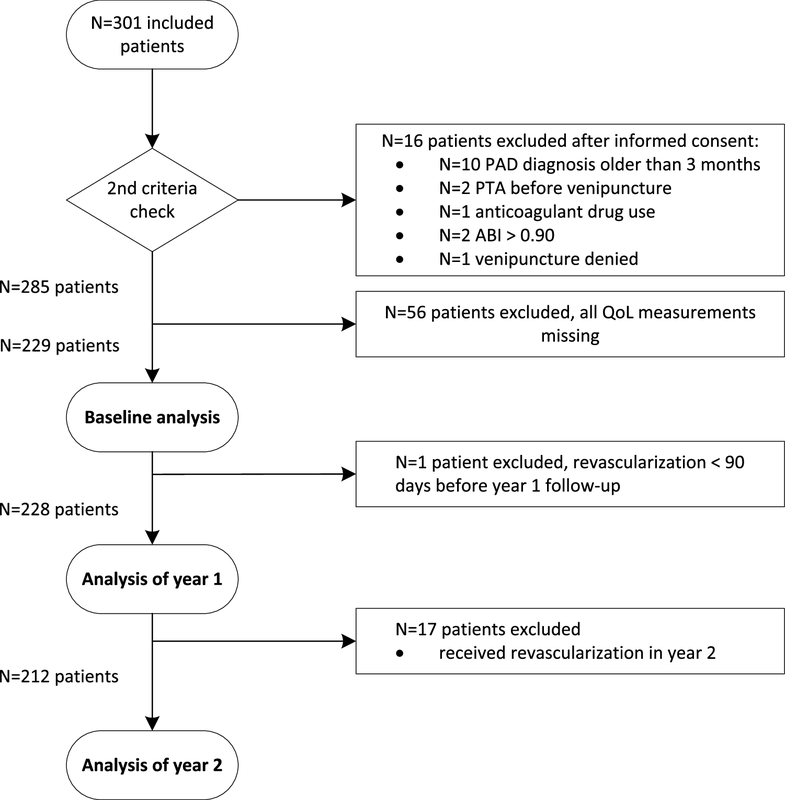 A different study had found age and diabetes to correlate with SF-36 scores between 1 and 7 years after revascularisation or amputation for PAD; rest pain was tested and found to be insignificant, QoL before the intervention was not tested as a predictor . Differences in patient characteristics, outcome measures and variables in the regression analyses hamper the comparison of these results. As a result of adaptation and coping, patient VAS scores, as estimates of a patient’s own QoL, tend to be higher than EQ-5D scores which reflect the public’s preferences for a patient’s health state description [12, 41, 42]. Our results are in line with these expectations. Furthermore, the mean difference between baseline EQ-5D and SF-6D in our study (EQ-5D 0.052 points larger than SF-6D) was similar to that in other patient populations . The observation that the effect of revascularisation on QoL was larger measured by the EQ-5D might be explained by a floor effect of the SF-6D. The SF-6D, as it was designed to assess QoL in the general population, tends to produce relatively high utility values in patients with a larger disease burden [5, 39]. Figure 5 in Appendix 1 shows that in our sample, values below 0.55 were rare. This floor effect can then cause decreased sensitivity in health states of lower QoL [5, 14, 27, 43, 44, 45]. Consistently, it has been hypothesised that QoL valued by the patients themselves have a ceiling effect and reduced discriminative capabilities, which might explain low VAS change scores . Figure 5 in Appendix 1 indicates scores above 0.9 were rare. However, previous studies also identified a potential weakness of the EQ-5D, the overestimation of QoL due to the avoidance of the third and most severe level [29, 43]. In other populations, less than 1% made use of level 3 of the domain ‘mobility’. Avoidance of mobility level 3 can cause an insensitivity of the EQ-5D to improvements in mobility. Figure 3 shows that in our study, only 0–3% of patients responded with level 3 in this domain. Insensitivity to change, however, was not indicated in our results considering mobility was a significant driver of QoL change after treatment. Moreover, a previous literature review concluded the EQ-5D to be more sensitive to change than other generic measures in PAD patients , results that we confirmed with the comparatively large estimated marginal means of treatment and the comparatively large difference between treatment groups. A first strength of this study is the selection of participants; the study population consisting of patients referred to the vascular surgery department for PAD diagnosis reflects the spectrum of PAD patients, including patients with varying medical history and PAD severity. Our outcomes are likely generalisable to PAD patients in secondary care overall. Secondly, by using PS matching, the observational data were resampled to allow for comparisons of revascularised and conservatively treated patients, thereby enabling comparisons of treatment effect. Thirdly, by analysing three widely used QoL metrics, one of them being the current standard in assessing QoL for economic evaluations in, for instance, the Netherlands  and the United Kingdom , and comparing their scores and performances, this study provides well-needed insight into the strengths and weaknesses as well as the suitability of the metrics for economic evaluations regarding treatment of PAD. The study also suffered from several limitations. The inclusion time just short of 5 years may have allowed for techniques to evolve over time so that patients might have been exposed to varying treatment methods. Expert opinion indicated these developments were not substantial at the study site. Patients using coagulation-altering medication were excluded. Given these medications will be prescribed for atrial fibrillation, a condition vastly affecting QoL [47, 48, 49], the excluded patients might be a subgroup with especially low QoL. As a result, our QoL estimates may be an overestimation of the QoL in the total incident PAD population. Another weakness is that, although this is extremely unlikely given the patients’ long treatment records in the participating hospitals, we cannot rule out that patients could have received revascularisation elsewhere that was not reported. Our research also highlighted several implications for further research. Given the variability of revascularisation effect after accounting for a number of patient characteristics, further research should identify patient characteristics of influence, e.g. socioeconomic determinants such as SES, housing and activity level in daily life, or further PAD-specific determinants such as length and location of the occlusion. The relatively small sample size, especially of revascularised patients, may be a weakness of the study as it may have caused relationships or differences that are present to be statistically insignificant. In this respect, it is important to recall that absence of evidence is not evidence of absence . And lastly, the umbrella term (peripheral) revascularisation summarises a number of interventions aimed at restoring blood flow to the leg. Considering the on-going discussion about patency of endovascular vs. surgical revascularisation , further research should compare the sustainability of QoL gains acquired by different revascularisation techniques. Data from randomised controlled trials would furthermore negate the need for propensity score matching as an adjustment for confounding by indication, and would thereby enable stronger conclusions about the comparison of treatments. The findings of this study show that conservative and invasive treatment both have a positive effect on QoL, and the effect of invasive treatment is sustained over 2 years. Significance tests show no difference between the treatment options. The results of our analyses confirmed advantages of the EQ-5D in detecting change over time and differences between groups. Our results therefore indicate that EQ-5D utilities may be most suitable for QoL measurement in patients with PAD, and support the preferential application of the EQ-5D in this population. The finding that the magnitude of revascularisation effect is influenced by baseline QoL may be relevant for clinical decision making, as it can give an a priori estimation of the expected QoL gain in individual patients. We want to thank the discussants and attendees of the Lowlands Health Economic Study Group Conference 2018 for an interesting and fruitful discussion of the manuscript. Furthermore, we want to thank all patients, nurses and clinicians involved in the INCOAG study for their significant contributions. SP, BR, AC, JD and MJ have nothing to disclose. RO reports personal fees from Daiichi Sankyo, personal fees from Bayer, personal fees from Pfizer/BMS, outside the submitted work. HC reports grants from Bayer, grants from Boehringer Ingelheim, grants from Pfizer/BMS, personal fees from Stago, grants from Leo Pharma, outside the submitted work and HC is an unpaid chairman of the board of the Dutch Federation of Anticoagulation clinics. See Tables 5, 6 and 7 and Figures 2, 3, 4 and 5.
not meeting the inclusion criteria. See Tables 9, 10, 11, 12, 13, 14, 15, 16, 17 and 18.